If a landscape is neglected, there’s no band-aid that will instantly bring it up to standards. We say this because now is the time of year when we conduct our quarterly Quality Audits. 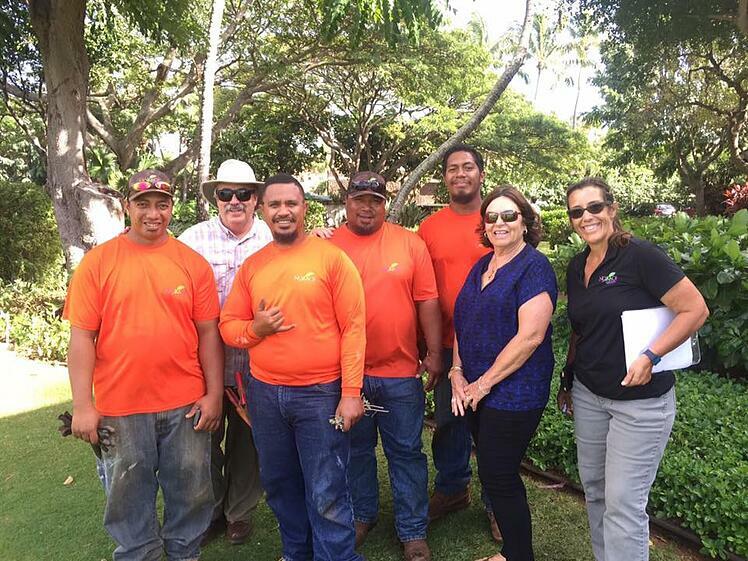 During the next several weeks, the No Ka Oi team will be evaluating the results of the landscape services we provide on your commercial grounds. You might think we’re paying more attention to maintenance now that it’s audit time. But remember, landscapes grow over time. There’s just no way we could make your property go from 0 to 10 in a week. There’s no cramming for this “test” to ensure your commercial property meets our high standards. 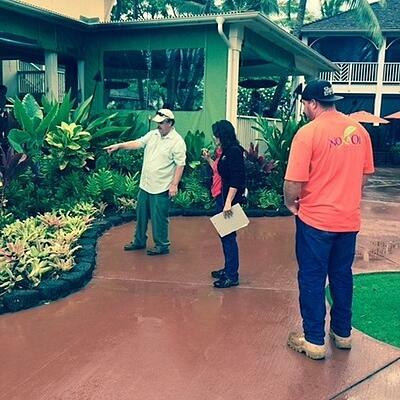 At No Ka Oi, we work every week of the year to create a beautiful outdoor environment on your resort, retail and condo association property. High quality is the result of our continuous commitment to delivering professional landscape maintenance services, every day of the year. There’s no such thing as dormant season here on the Garden Island. So, let’s talk about what these Quality Audits include, and how you can use the information to plan for landscape services in upcoming seasons. 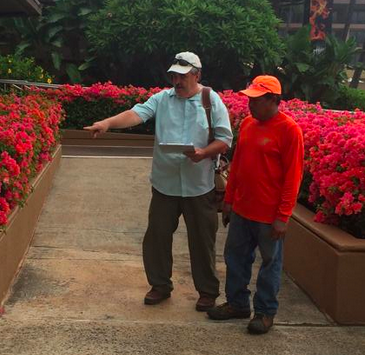 The six areas No Ka Oi evaluates during quality audits include: turf, flowers, ornamentals, trees, irrigation and general/safety. There are specific inspection points for each category. The overall checklist ensures that our team takes a detailed, comprehensive look at your property—every aspect of your grounds. We’re looking at the sidewalk cracks and noticing any weeds that push through. We review plant health and examine whether deadheading was completed. Our team reviews turf quality, including edging and the mowing pattern. We tune into areas that seem too dry or too wet, investigating the irrigation system for potential faults. You might wonder: Don’t you look at all of these details during every visit? Quality counts! Our Quality Audits are a culmination of a season or year’s worth of dedicated landscape maintenance visits. Our focus one week might be turf, while the next week we might mow and then tend to ornamentals. Quality Audits evaluate the big picture of your landscape. This is why we couldn’t possibly “improve” your property the week before to show top results. Quality Audit scores are based on commitment to a yearlong landscape maintenance program. The results of a Quality Audit can help you plan for future landscape enhancements or upgrades. For example, if problems were spotted with an older irrigation system, you might plan to upgrade sprayheads or add a smart timer and other technology the coming year. If some plants were noted as “aging out” of the landscape, you can build room in the budget to replace those. A Quality Audit can open up conversations about your goals for the property. Scores show that your property is in perfect condition, but you want to improve the guest experience at your resort by adding a fire pit or enhancing an outdoor seating area. With a Quality Audit to direct your landscape maintenance priorities, you can target potential projects and plan for them. Quality Audits are designed to empower you, the property owner or facility manager. It’s true that information is power. 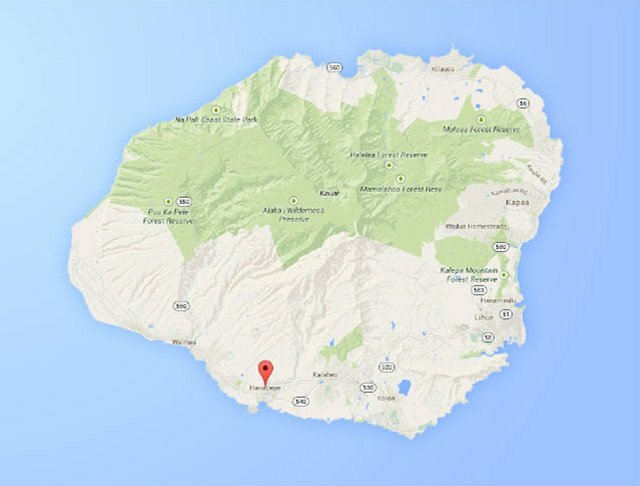 By providing you with a landscape maintenance score sheet, we can discuss areas of your Kauai property you’d like to focus on the coming season. 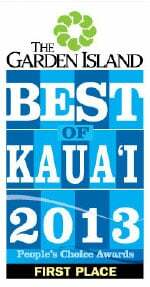 Let’s talk more about how No Ka Oi can help you get the landscape results you expect. 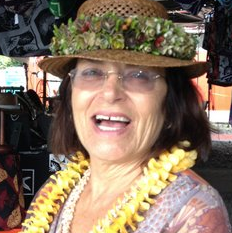 Call us any time at 808.335.5887, or fill out this simple contact form and we’ll get in touch with you.